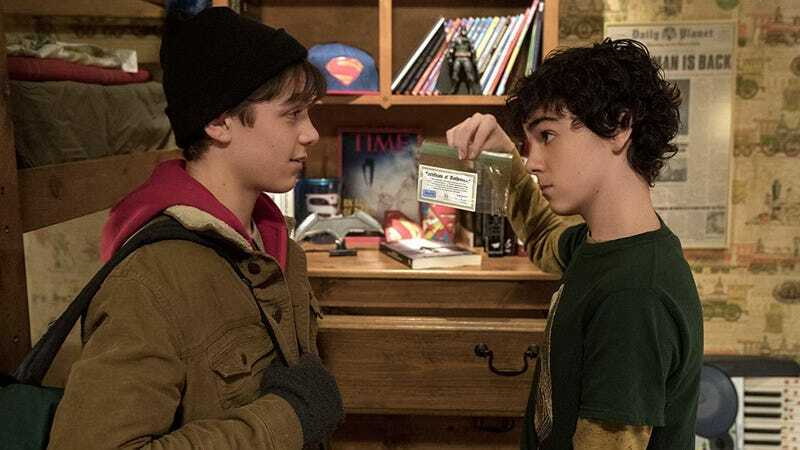 The relationship between Billy (Asher Angel) and Freddy (Jack Dylan Grazer) is the heart of Shazam. Billy Batson, the character who becomes Shazam, is obviously the star but that role is split due to the basic premise of the film, that a young boy is given the ability to become a full-grown superhero. When Billy is himself, he’s played by Asher Angel, but when he turns into the superhero Shazam, he’s played by Zachary Levi. And to cast both versions of the character, the producers used Grazer. Warner Bros. screened about 15 minutes of footage from Shazam for press last week and it was heavy on the Freddy, for good reason. He’s not just Billy’s (almost) sidekick, he introduces Billy into the superhero world and helps the film expand its themes. To explain, first, check out this brand new featurette. The new footage we viewed began with a scene in the school cafeteria where Freddy asked Billy which power he’d prefer, flight or invisibility. Freddy says most people pick flight because it’s more heroic and invisibility is, well, creepy. However, he believes if they could answer anonymously, most people would actually pick invisibility because they don’t see themselves as heroic. So right off the bat, Freddy is kind of setting up the themes of the whole movie: Do we have a hero inside of us or not? In the next scene, Freddy gets hit by a truck driven by a bunch of bullies. Why these kids literally hit him with a car, we don’t know. But it’s Billy who defends Freddy, smashing the bully in the face with a crutch. He races away from them onto a train hoping to get to Philadelphia’s 30th Street Station. He never makes it. Instead, everyone on the train magically disappears and it stops at the Rock of Eternity, a dark, mysterious place where a wizard named Shazam gives Billy, a person he believes to be pure of heart, all his powers. Where does Billy immediately go once he’s Shazam? To see Freddy, of course. Freddy is very excited the first time he meets Shazam. Jazzed up with Billy’s new abilities, Billy and Freddy go to a convenience store to buy beer. Wouldn’t you know it though? It gets robbed while they’re inside. Billy attempts to stop the robbery only to have the robbers shoot him, but the bullet just bounces off. Freddy freaks out and asks the robbers to keep shooting him, which they do. Then Billy tosses them out of the building. They crack a beer to celebrate before realizing they hate how it tastes. All of the footage had a real levity to it. The jokes flew fast and furious and while not all of them worked, it’s important to note the scenes screened were edited together fairly loosely. There was connective tissue missing, some music, and more. So while it didn’t all play like gangbusters, both the intention and material were there. No matter how well these scenes work in the final film, though, it’s very obvious Shazam is exploring new aspects of the DC universe. Not just tonally, but contextually. Director David F. Sandberg with his two stars. Again, much of that will be seen through the eyes of, who else? Freddy. He somehow has a bullet that was stopped by Superman, as well as all kinds of newspaper clippings and records of events from the previous movies like Batman v Superman and Justice League. And yet, while Freddy helps ground Shazam in the DC universe, Sandberg doesn’t want people to think the movie is just that. However, Sandberg and Safran do acknowledge that they would love to see Shazam’s universe expand. When Billy walks into the Rock of Eternity, there are artifacts that tease at different parts of DC Comics history. They may even be a tease of Black Adam, who is not in this movie but is a character they’d love to see face Shazam in the future. No, this one will just see Billy Batson try to reach his full potential as the new DC hero, Shazam. And, with the help of his good friend Freddy, he’ll almost get there too. We too, await Shazam’s ultimate potential—and that goes for the character and the movie. It opens on April 5.